How is your ball spinning? of Tincher Pitching events near you! In a sport where dominating pitchers tend to stand well over 6-feet tall, people often ask how a pitcher like Angela Tincher, just 5’7” could pitch at speeds around 68 mph. Along with her velocity, Angela was able to create dramatic movement on the ball, establishing herself as one of the top pitchers in the college softball record books. It began when she was a little girl who wanted to try softball in a small Virginia town. She was not big or athletic, but loved the game and she wanted to be part of the action. She begged her father to teach her to pitch. Since there were no pitching instructors in the area, her father thought it would be fun to learn about this strange motion together. Denny Tincher began a study that would last a lifetime, going to college games to video great pitchers, studying videos of top pitchers in the College World Series, and simply working closely with his daughter to make sure she felt fluid, natural, and explosive. With high goals, strong body awareness, and the will to win, she began to excel. Angela Tincher went on to become the 2008 College Player of the Year. Angela stunned the world in 2008 with a no-hitter against the U.S. Olympic Team, had the lowest ERA in the country for two consecutive years, and finished her career as one of the top 3 in NCAA record books for total strikeouts, as well as average number of strikeouts per game. She led her team to the College World Series, went on to play professionally in America and Japan, and along the way sparked a dream within her father, Denny, to find ways to help other pitchers break down barriers that hold them back. It was not long until pitching instructors in many states noticed the huge difference Denny was making in their students at camps and clinics. Those instructors began to ask if they could study with him, and an idea was born: to gather people with a similar passion, with great curiosity and creativity, with strong softball backgrounds, and who would work together to study and research ways to change pitching in America. 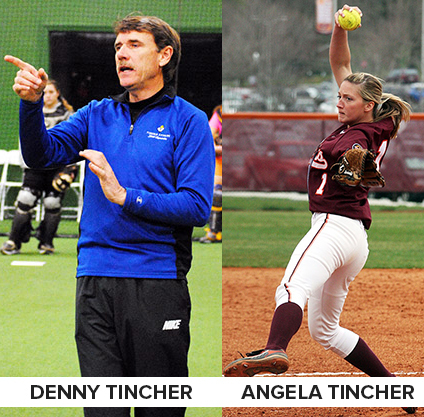 Fast forward to today: Scores of college pitchers come out of the Tincher Pitching organization every single year, and their impact is felt in every division of college softball right up to the College World Series. This amazing team of Certified Instructors expanded to deal with other issues pitchers face, like injuries, strength training, and even the mental game. You can read more about these incredible professionals on our Instructor page. The training they receive is thorough, intense, and personal with Denny mentoring every step of the way. If you have the desire to reach goals others say are unobtainable, perhaps you have reached a plateau, or feel you have a lot of untapped potential, contact one of our Certified Instructors today. We are Changing Pitching in America! “My daughter started taking lessons with Denny at 8 years old. She has never been to any other pitching instructor. Working with Denny is the best softball decision that we made. He taught her the proper mechanics at a very young age and connected us with a qualified strength trainer who understands pitching. Denny gave her confidence to dream big and to ignore anyone who doubted her. Everything taught by Denny is research based and proven. Every drill he can explain why and teach how it should feel. He has turned pitching into a science. My daughter had offers from top ranked schools from all parts of the country and recently has accepted her dream offer from her dream school in the SEC. We couldn’t have done it without Denny and Tincher pitching.” – Brian and Tracie from Riner, VA ***Daughter accepted D1 SEC offer at 13 years old. After I graduated in 2012, I started coaching college right away. However, I was finding that all the stuff I had been taught wasn’t helping the girls I was teaching! After hours upon hours of study and internet research I started to notice commonalities in pitchers that I liked watching and who were also successful. Clearly, these kids must be coming from the same place. Eventually, I tracked a girl back to Denny Tincher and Fluid Dynamics. I went to one clinic and I was HOOKED.It’s amazing—if you teach girls a style that works with their bodies, THEY LEARN. They IMPROVE. And most importantly, they don’t hurt themselves! If you’re a parent or pitcher reading this, and considering trying it out, PLEASE DO. Give it one or two sessions, and you’ll be hooked. I wish I had been taught this way to start with, and I’m never going back to anything else.